When Mina was eight years old she moved with herfamily from Petach Tikva to Kiryat Arba. She was the first daughter of Moshe and Chaviva Tzachor, and although she had two older brothers, Mina always felt she had the responsibility of a first born. Often she would help with the laundry or prepare dinner or babysit her younger siblings. She loved helping out and felt empowered to have so much responsibility and to be trusted by her parents at such a young age. Little did she know that just three years later, her role as an older sister would become much more significant. When Mina was twelve, her parents came across an article in the paper about a little blind baby looking for a home, a family to take her in. They rushed to the hospital and immediately fell in love with her. Mina’s mother was then pregnant with her eighth child. “I remember the day my parents first spoke to us about Liat,” Mina shares when first asked how her adopted sister joined the family. “They called my brothers and me into the living room and told us about a blind baby who had been left at the hospital by her biological parents. They asked our permission to take her in and give her a family.” Mina was the first to vote yes. She promised her mother that she would support her and help with whatever she or the baby would need. Her brothers, on the other hand, were not very happy with the idea. In the days that followed, Mina would imagine what it would be like to have another sister and was excited to share her room with the new baby. Not long afterwards, Chaviva and Moshe brought the little baby home to meet the rest of her new siblings. They named her Liat, in Hebrew, “you are mine.” They wanted it to be clear that no matter what challenges they would face, Liat was a part of the family. The first two years were filled with uncertainties regarding Liat’s medical condition and physical abilities. Not long after her arrival, the excitement Mina felt at first slowly wore off. Liat was a difficult baby and had many medical issues in addition to her blindness. She even looked different, which made it harder for the sisters to form a bond. Mina felt overwhelmed. In truth, she was disappointed. Liat wasn’t even close to what she had imagined. Mina kept her distance and felt that she could not keep the promise she had made to her mother. “I remember one night,” Mina shares in tears, “I woke up and stood by the crib whispering to my sister that I hated her. You must understand,” Mina explains, “I was only a child and could not understand why this baby wasn’t the sister I had expected.” She nudged Liat out of spite causing her to roll on her face. Little Mina wanted to make Liat cry. But nothing happened. Mina stood over her baby sister and watched her and began to realize that even though Liat was uncomfortable, she did not move or cry. Only then, in that moment of anger and resentment, did Mina understand how helpless Liat really was. And it was at that moment that Mina decided to devote herself to Liat, to be a true sister to her in every way possible. Mina remembers how for years, her mother would take the bus with Liat to Jerusalem, to a special school there, and wait patiently for her in Jerusalem until it was time to return home. Then they would travel back to Kiryat Arba where her mother took care of the rest of the family. It was very difficult but the family, as a unit, always supported Liat and made sure she got the best care possible. 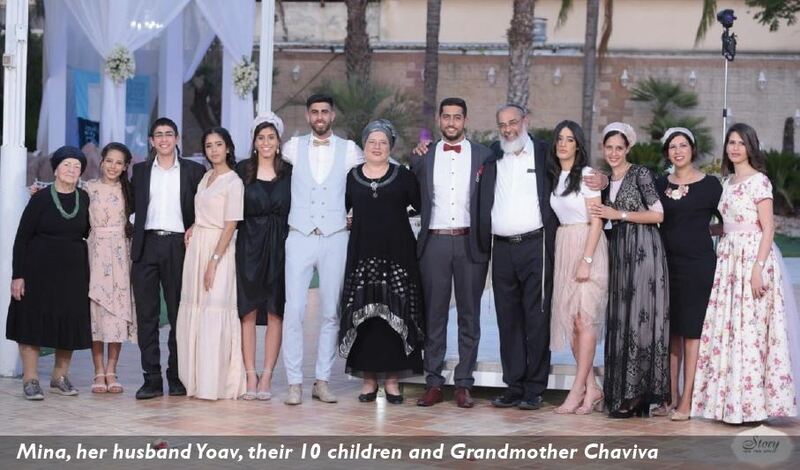 Today, Mina Yehudit Ozeri is a mother of 10 children and grandmother of 11. She runs the Neve Avraham Child Development Center in Kiryat Arba, like her mother before her. 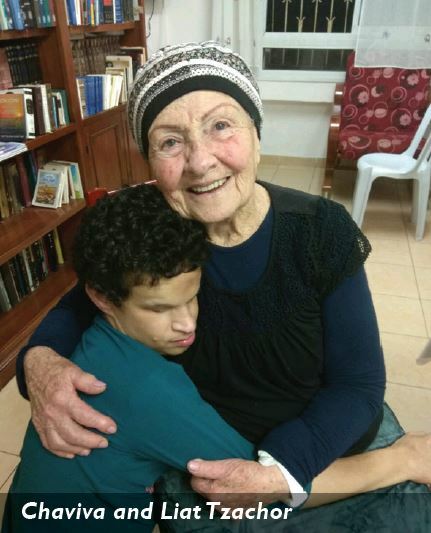 The center was founded by her parents, Chaviva and Moshe, and has serviced the children of Kiryat Arba and the surrounding communities for the past 28 years. Neve Avraham helps children with developmental delays and learning disabilities in addition to children with Autism and Downs Syndrome. Chaviva, Mina’s mother, believed that every child deserves to reach his or her potential and most families are unable to travel distances to obtain the necessary services. That is why Neve Avraham was founded – to provide these services close to home. For Chaviva it wasn’t enough to adopt this special girl and give her everything she needed to become the best person she could be. Chaviva wanted to help other parents and families overcome their challenges. She wanted to give other children hope and support as close to home as possible. The warm heart and extreme devotion that radiates from Mina must run in her family. The wonderful story of the Tzachor family is amazing and Mina brings such a unique perspective to it all. When asked about her relationship with her sister today, Mina answers “Liat loves me, and I love her.” And even though Liat does not speak, the only two words she is able to say are Mother and Mina.